SWIMMING POOL SAFETY IS ESSENTIAL FOR A HAPPY STRESS FREE EXPERIENCE. Always have a Safety Ring or Floatation Device near your pool. Dolphin have a range of Buoyancy Aid Swim Suits to give your youngster confidence in the water. Access equipment including Lifts for inground pools and above ground spas and a mobile Aquatic Chair for use in pools with a ramp are also available from Dolphin Leisure. There's no better exercise than swimming, so we would like to introduce a range of products to enhance your exercise program. Whether it's for Injury Rehabilitation, Aqua Therapy or Aqua Fitness, we think that by using specialised equipment it can speed up recovery time, or give you an extra incentive to achieve the results that you are looking for. With weights, floats and tether cords to name but a few we are sure that our latest ranges will add a whole new dimension to your daily swim routine. Access to aquatic environments is vitally importnet for both mobility challenged individuals and seniors. A pool provides the optimal setting for low impact exercise or therepy. Be prepared ADA Pool Accessibility requirements is law in USA. This new legislation requires commercial Swimming Pools to provide means of access for their pools. Which pool lift is right for you? Pools vary greatly so provide us with some basic information about your pool and let us suggest the best lift for your pool. Also available an informative web site www.poolslifts.com is a dedicated web site to help you meet the ADA Pool Accessibility requirements. These Swim fin Shark Training Aids look lots of fun but they are also serious training aids as they are perfect to encourage the new swimmer and enable a wider range of swimming strokes. Also ideal to give your dog exercise. HANDY BACK PACK SALE price as only 2 left colours vary. 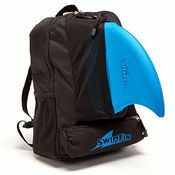 These back packs are especially made to hold the shark fin and your swimming accessories and a drink. 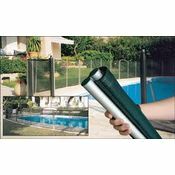 This Plastica Rollaway Mesh Fencing System provides your pool and pond area with the protection and elegance it deserves, its layout can follow pool contours as well as patio and lawns.